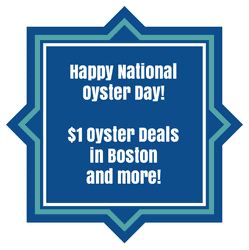 National Oyster Day Deals in the Greater Boston Area! Today is National Oyster Day so what better way to celebrate than rounding up all the cheap oyster deals and specials in the Greater Boston area! $1 oysters anyone? If you are looking for more oyster deals, check out Eater Boston’s awesome $1 Oyster Guide for even more ideas. Also, don’t forget to check out Boston on Budget’s Cheap Eats page (newly updated!) for more oyster deals for every day of the week as well as other food specials!